First of all I washed them well and let them drain. In Greece lemons are not waxed, so this saved me some extra effort from scrubbing them. Another thing we do in Greece, especially now with the economic crisis, is not to waste anything. Even the squeezed lemon shells have a purpose. Put all the syrup ingredients in a pot. Bring to a boil and simmer for 5 minutes. Add the syrup to the alcohol gradually. Mix, taste until it reaches the desired sweetness. The liqueur is ready for bottling. Let it age for a few months. Usually the leftover peels are discarded but instead of throwing them away, I boil them with the syrup for about ten minutes, until they become soft. I then drain them from the syrup and dip them into sugar. The peels have a slight taste of tsipouro. I let them dry well and store them in an air-tight container. If you want to make them from scratch I have posted the recipe of candied lemon peels when making lemon curd. The second bag I mention aboved, had 35 lemons which yielded 2+ litres lemon juice. One easy way to preserve lemon juice, is to fill ice cubes and store it in the deep freezer. If you have small plastic cups, that works as well, so long as you know how much it contains. (I also do the same using bigger cups, for orange juice and tomato juice). Each time you can use as much as you like. This time I did not have enough sugar, so I added some Citrus blossom honey. I thought I was making something unique but when I google searched it, unfortunately others had thought about it before me. Preparation method, same as the previous recipe. I used 1 litre lemon juice to make Lemon Squash, which is a wonderful summer drink and with the remaining I made lemon ice cubes. I used some of the lemon squash to make iced tea. Instead of making the classic Lemon Ice Tea, I used green tea. I only had the plain green tea at home but you can use other flavours as well. I made the tea using fresh mint to flavour it, which makes it much healthier. However, you can use other flavours or other types of tea you like. Put tea bags, mint, cinnamon and cloves in a metallic bowl* and pour boiling water. Steep for 5 to 10 minutes. If you want a stronger tea, add another tea bag. Remove tea bags and stir in lemon squash. (If you want it less sweet add less lemon squash). Allow tea to cool and strain in a bottle. Refrigerate for at least an hour before serving. Add extra ice cubes and serve with a slice of lemon or fresh mint leaves. *I used a metallic bowl because I do not have a tea pot here in Assini. 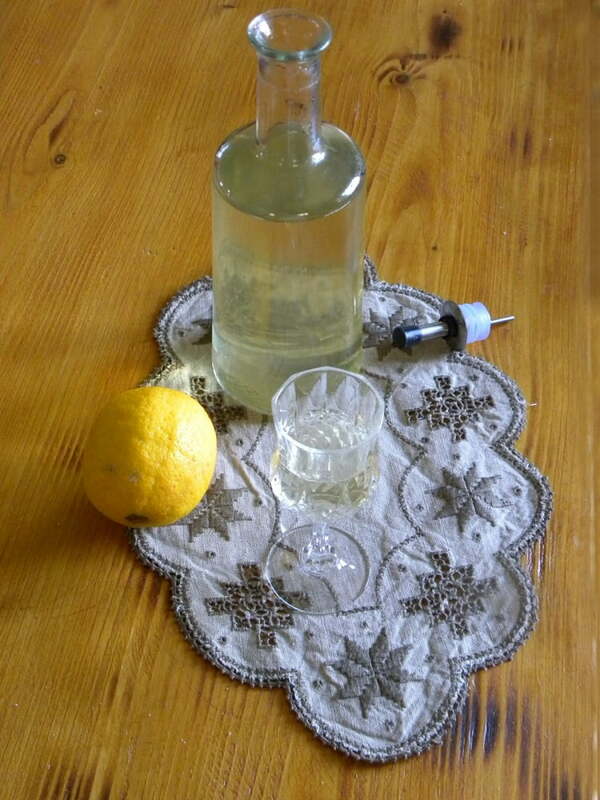 This year, when I made limoncello again, I grated the zest and I put the bottles with the alcohol in the closet. I totally forgot about them and when I found them, almost three months later, they had a lovely deep yellow colour. I wonder, was it the zest or the longer time steeping that produced a darker yellow colour? Anyway, this is how I will be making it from now on. In order to remove the zest, pass it through a sieve first and then again through a coffee filter an then mix it with the syrup. Limoncello is a lemon flavoured alcoholic drink made from the peels or zest of unwaxed lemons, which are steeped in a neutral alcohol. Kopiaste and Kali Orexi ! I love limoncello. I wish I had so many lemons! Ivy do you have a recipe for puff pastry in goat cheese, apparantly when my hubby was 18 yrs he stayed in Greece for one month and he always tell me he used to have a lot this puff pastry dish with goat cheese and they were delicious. If you don’t have no worries. Jealous, jealous, jealous. I want to make everything! Ivy thankyou, i will go and check the link you gave. Happy Cook, try these http://www.kopiaste.org/2007/12/easy-cheese-puffs-with-feta/ they are great. Instead of feta you can add goat cheese or both and instead of phyllo you can use puff pastry, cut square sheets, put filling in the centre and fold into a triangle. Press with fork both sides to seal, brush with egg and bake in the oven until golden brown. I love limoncello and anything with lemon. I wish I was your neighbour!